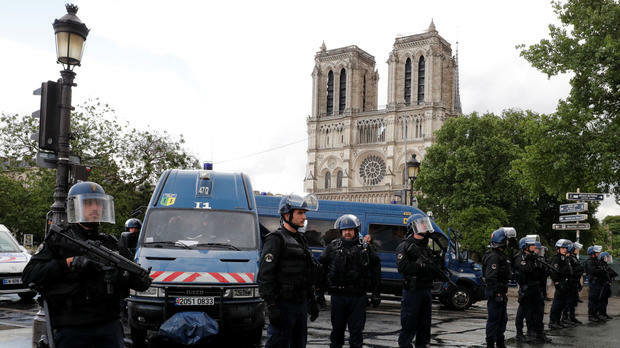 PARIS -- A police officer shot and wounded a man who attacked a group of three officers with a hammer near Notre Dame Cathedral on Tuesday, authorities said. Interior Minister Gerard Collomb told reporters that the man yelled "this is for Syria" when he attacked the officers. Collomb said that an officer used his weapon to shoot the assailant. The man was also armed with kitchen knives, Collomb said. CBS Radio News' Elaine Cobbe reports that the investigation has been handed over to the police's anti-terrorism unit. The incident happened around 4:30 p.m. Large numbers of police cars filled the area on the Ile de Cite island in the Seine River in the center of Paris. Hundreds of people on the esplanade in front of Notre Dame were evacuated and authorities urged people to stay away from the area. People inside Notre Dame, the nearby Sainte-Chappelle cathedral and area bars and cafes were told to stay inside. Mikey Kay, a retired wing commander for the British military, reported on CBSN that police sealed off a bridge to motor traffic near the cathedral, but it was open to pedestrian traffic. Never bring a hammer to a gun fight. The guy yelled..”It’s for Syria”...because he knows ISIS is getting ‘hammered’ now in Raqqa....and loosing their push for the caliphat. All countries should be on alert for these lone wolfs now....ISIS is loosing...and calling all their followers to attack. Pièce et parcelle of living in a modern, urban, dhimmi big city, mon freres. The French police have guns? I wonder what his motive could be. So far, no clue. “This is for Syria” Was he an Israeli? A pita bread baker? An olive grower? What is the Syria connection? Are we left to come up with our own conspiracy? Okay, I’ll take terrorism for 100 points; RADICAL ISLAMIC TERRORIST! The press won’t even say it, accept Islam or be arrested and jailed for being a racist bigot. How big are these “kitchen” knives? Especially the knives used in London. They certainly did a lot of damage. in Paris the police are part of the Police Nationale. Yes they are armed. Why would anyone think otherwise? You’ve got your 100 points. The Telegraph (UK) is reporting that the terrorist is an Algerian “student’ in his forties. As an aside, it’s interesting (and sad) that for an American to get the full story, you have to rely on UK sources. When I was in Paris two years ago, there were armed police everywhere around the major tourist sites. The French Prime Minister cannot find a motive behind the attack. Thus is the marked difference between France and England - go jihad stupid there expect to eat lead in short order. Chances are good there will be someone handy nearby to bring the pain. I remember Paris when I was in the service in the early 80s. It was a Beautiful City and one of the great tourist spots in Europe back then, now it is a semi broke down PC run city that I thought that it would never had happened! The attacker’s name wouldn’t have been “Maxwell”, would it?